Zapad 2017 debate continues, as does UN Donbass peacekeeper debate. Russia’s ban on social media cited as reaction to effectiveness of OSINT. FA essay on Putin losing control of nationalists should have been written 3 years ago. Russian Senate names nine main threats to Russia – every single one is provably self-inflicted. Gudkov and Pastukhov on reversion to the Soviet, while Russia promotes bitcoin in Transnistria, it aims to ban it in Russia. More essays on the dive into the abyss. Fedyk on Russian Zapad 2017 play to assume control of Belarus military. EP seeks to draw Moldova closer, while Putin earns a COCW. Poroshenko attends PACE summit in Strasbourg and presents an excellent speech. Czech President Zeman gets a COCW for his effort at PACE. Voronenkov widow says her ex Tyurin was not motivated strongly to kill her husband, putting focus on FSB. New HQ scheme to be introduced. Donbass fires continue, another Russian infiltration team waxed at Svitlodarska Duha bulge (Debaltsevo). DEFMIN Poltorak briefs on new acquisitions. Ukraine grabs limelight at AUSA in debut presentation. 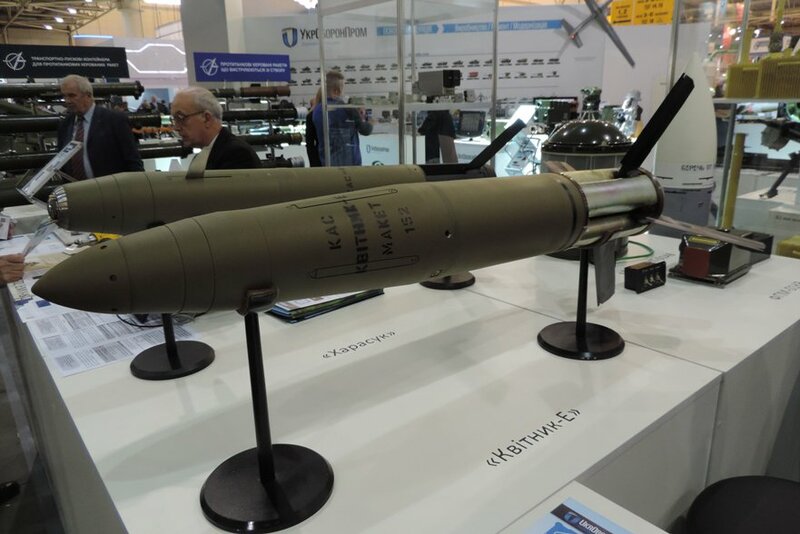 Multiple IMINT from Kyiv Arms & Security 2017 show – Yastreb FAB-250 LGB kit, Karasyuk 122mm Precision Guided Artillery Projectile, inertially guided 152mm Kvitnik PGAP variant, 80K6T AESA, Arsenal’s ZSU-23-4М upgrade with a solid state “Digital Antenna Array” and thermal imager. Iranian opposition briefs on covert nuke weps effort in Iran. Hezbollah as domestic terrorism risk in US. Col. Igor Girkin of Slavyansk fame tells media of heavy Russian body count in Syria. Turkey and AFG reports. POTUS to visit RoK in November? DPRK hack report disputed by US. B-1Bs fly near DPRK. LRM promotes female friend to key propaganda role, trial of clueless assassins continues. Dickinson on Russia propaganda in history. ATACMS replacement. Kaspersky backdoor discovered by Israelis during penetration of Russian sites. Some most interesting US domestic reports. 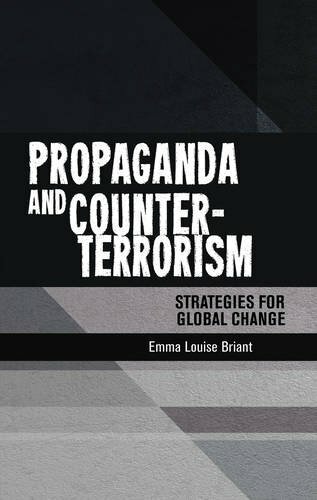 Beyond elections, cyberwarfare has made traditional rules governing armed conflict irrelevant. Just this week, it has emerged that Russia has targeted NATO soldiers’ smartphones in order to gain information about troop activity and to intimidate soldiers. Such instances beg the question: What is “deterrence” in the digital world? What is a “proportional response” when a ship’s navigation system is hacked or a power plant shut down? What happens when it takes months to track down who was responsible for a debilitating attack on the financial system? The response to these cybercrimes must be international and must be broad-based, ranging from regulating social media to guarding our electrical grid and electoral systems. Building a collective defense in this new code war is at least as great a challenge as staving off the territorial or regional threats of the Cold War, when NATO was established in order to respond to threats in Europe…. Can the wider West establish a global “cyber NATO?” It would be difficult but so too was the founding of NATO itself, which was called into being only after successive communist coups in Eastern Europe. When it comes to digital threats, the liberal democratic West has been subjected to enough wake-up calls…. A law drafted by Russia’s ministry of defense, which would ban its soldiers’ use of social media, serves to confirm the work of open-source researchers reporting on the illicit presence of Russian troops in Ukraine and Syria, according to Atlantic Council analysts. “The Russian authorities and media have repeatedly tried to undermine open source researchers by arguing that they ‘only’ used social media,” said Ben Nimmo, an information defense fellow in the Atlantic Council’s Digital Forensic Research Lab (DFRLab). “This shows Russia knows the researchers were right.” The ban, which serves to corroborate reports of Russian troops’ activity denied by the Kremlin, “confirms the value, and the power, of open-source research,” according to Nimmo. “It’s a validation of the work that they’re particularly nervous about it,” said Graham Brookie, deputy director of the DFRLab, adding: “As this work gains notoriety, [the Kremlin’s] public posture against it increases.” As first reported by the BBC, the initial draft of the law, set to go into effect in January 2018, would prohibit Russian professional military personnel, not conscripts, from uploading to the internet photos, videos, or other material which could reveal details about Russia’s military activity. The Kremlin “knows this is a problem that they face, and they’re grasping at how to deal with it,” said Brookie. “It’s interesting that the Ministry of Defense drafted a law to codify this ban on soldier selfies rather than issuing a military order to stop the behavior,” he added. “It’s a censorship law, essentially,” Brookie said. “On a tactical basis, they will have difficulty enforcing the ban,” he added. Nimmo described how, in the past, the private posts of Russian soldiers have made public the details of troop movements in Ukraine and Syria. “Social media posts have provided crucial evidence of Russian military operations in Ukraine and Syria, including operations the Russian government denied conducting,” he said. Open-source research organizations such as the DFRLab and Bellingcat leveraged the publicly available information to reveal a cohesive picture of Russian military activity abroad and implicate the Kremlin. According to Nimmo, “it looks like the Kremlin wants to get better at covering its tracks.” When Russian President Vladimir Putin denied reports of Russian military involvement in the invasion of Ukraine in 2014, as well as the ongoing fighting in the eastern part of that country, an Atlantic Council report by the DFRLab, Hiding in Plain Sight, presented evidence to the contrary. The report accumulated open-source research, largely consisting of information available on the social media platforms of Russian soldiers, to confirm the presence of Russian troops in Ukraine. The fact that Russian President Vladimir Putin hasn’t stopped the anti-Matilda campaign reveals a paradox at the heart of his authoritarian rule. Paul Goble Staunton, October 11 – Moscow’s case against theater director Kirill Serebrennikov is not the sideshow many assume, Vladimir Pastukhov says. Instead, it marks a fundamental and even dangerous change in the Kremlin’s approach to the intelligentsia and the very possibility of any kind of aesthetic freedom in Russia. In a 2600-word commentary this week, the UK-based Russian historian says that there are many lessons members of the Russian intelligentsia and indeed all who care about the future of that country should draw from the Serebrennikov case, all of which are extremely disturbing (republic.ru/posts/86877). First of all, he suggests, the case and others like it show that a third question has now been added to the classical inquiries of the Russian intelligentsia: “who is to blame?” and “what is to be done?” Now, Pastukhov argues, the question “why is something being done?” of equal or even greater moment. Unlike the first two, this question is “not abstract but very concrete” and requires a consideration of the motives of particular individuals in particular government agencies. What is most striking about the Serebrennikov case, he says, is “not so much its ruthlessness as its senselessness.” Many people believe that Serebrennikov is guilty as charged, that he violated some law and is now being brought to justice, Pastukhov says; but his case in fact is “a classic example of the legal arbitrariness of the Putin era” and one that says more about where the Kremlin is heading than many acknowledge. More evidence may come out in the trial, but it is already obvious that the charges brought against the director reflect a distortion of the law itself, a perversion of what the statutes actually say, in order that the powers that be can send a message to the intelligentsia and society as a whole. This is not a case of some “abstract confict of the spirit and the letter of the law” but rather a conscious use of a law that is not at all appropriate. Serebrennikov may be guilty of many things, including misuse of funds or not paying his taxes, but there is no possibility that he engaged in fraud. And consequently, this case “perhaps even better than all preceding political trials shows that accusations in theft have become an instrument of political repressions and that Article 159 (fraud) … now occupies the very same place which three quarters of a century ago was given to the infamous Article 58 of the 1922 RSFSR Criminal Code” which punished people for “counter-revolutionary activity.” To the extent that is true, the Russian historian says, “Serebrennikov is a thief just as Meyerhold was a counter-revolutionary.” There is of course “one essential difference between Stalin’s and Putin’s repressions.” In Stalin’s time, officials invented the charges and forced people to confess to them but t the same time “formal legality was undeviatingly observed.” In Putin’s, confessions aren’t needed because what is fabricated are not the facts of the case but its “legal basis.” Although the current version of terror is less bloody, he continues, “in long-term historical perspective, it is more dangerous than the ante-diluvian Stalinist model. Today, the very fabric of law is being destroyed,” and that in turn means that it will be even more difficult to climb out of this whole than it was from the collapse of the Great Terror. But the most important lesson of the Serebrennikov case, Pastukhov argues, is to be found in another place. “Serebrennikov and the powers are hardly elements alien to one another.” They are part of one system, deeply interconnected, and “therefore to describe their relations in terms of hostility and devotion is unjust.” Both are deeply “anti-capitalistic” in their attitudes, he argues, and thus the main lesson that the Russian intelligentsia should be drawing from the Serebrennikov case is “the simple truth that the loss of political freedom sooner or later leads to the loss of aesthetic and creative freedoms as well.” In reality, the historian says, Serebrennikov is “suffering not for the law or for politics but for aesthetics. At a certain instance, his non-traditional art became aesthetically alien to the powers that be,” and he and it had to be suppressed via the use of the criminal code. For a long time, the Putin regime “wasn’t interested in aesthetics.” It demanded loyalty from those artists it supported but did not dictate the content of the work. But “over the course of the three years since the beginning of the second Crimean war, the powers that be have essentially changed.” They “have ceased to be aesthetically neutral but rather have acquired a cearly expressed prophile, primarily Black Hundreds in its nature.” That is because, he argues, having gained support from “the most marginal and reactionary elements of Russian society, they were forced to stylize their worldview” according to the tastes of these groups. It is thus the old, old story: “First you use someone for your own political goals and then this ‘someone’ begins to use you.” But the powers that be “haven’t noticed that hey have become a hostage of those with whose help they ecuredd the reunification of Crimea and built Novorossia. [And] consequently, they changed their demands to the artist.” Under these new conditions, the powers weren’t prepared anymore to allow an artist to do what he or she wanted at least on government money. That might have been possible under “the gray Medynsky,” but it is hardly possible given the power of “’the black Poklonskaya.’” And hence the case. Thus, this case reflects two negative trends in Russian society: “the degeneration of the repressive apparatus into a terrorist machine, which works autonomous and without selectively strikes out for various goals” and “the secondary ideologization of the powers that be.” In short, Serebrennikov didn’t become different: the authorities have. By means of this case, Pastukhov concludes, “the government has sent a signal that it will no longer be indifferent” about what is on stage. And thus the relative freedom of the first two “post-communist decades is coming to an end. The Serebrennikov case is not an accident: it is the beginning of a new era.” Whatever happens next, the historian suggests, “relations between the post-communist powers that be and the post-communist intelligentsia have changed forever.” And at least in the next months and years, they will unfortunately ever more resemble “the ideological and aesthetic standards” many will remember from Soviet times. Paul Goble Staunton, October 10 – The relative paucity of detentions in Moscow during the anti-Putin Navalny demonstrations last weekend, despite the much larger and more brutal actions of the authorities beyond the ring road, has generated a lively discussion as to why the Kremlin didn’t come down harder. Two commentators, Yekatarina Vinokurova of Znak (znak.com/2017-10-09/myagkaya_reakciya_na_mitingi_novaya_taktika_ili_situativnaya_reakciya) and Dmitry Travin of St. Petersburg’s European University (rosbalt.ru/blogs/2017/10/08/1651541.html), provide some interesting suggestions. Vinokurova suggests that the answer may have been as simple as timing: the Kremlin didn’t want to spoil Putin’s birthday – the foreign media undoubtedly would have linked those two events together — or appear repressive when it was criticizing the Spanish police for their crackdown in Catalonia. She then queries five Moscow analysts for their reaction. Political scientist Abbas Gallyamov says that the authorities may have reacted as they did because they saw that the latest demonstrations attracted far fewer people than earlier and thus felt that they were “winners” and could afford to be generous. Aleksey Chesnyakov of the Center for Political Conjuncture agrees. This wasn’t a change in tactics. Rather it was specific to this day. What is disturbing, he continues, is that the authorities have such a limited number of instruments for reacting to any public manifestation, repression or non-repression. Yevgeny Minchenko, head of the International Institute for Political Expertise, agrees that the Kremlin’s response reflected the smaller number of protests as well as problems within Navalny’s own command. Aleksey Makarkin of the center for Political Technologies suggests that it was all a game: first the authorities threatened to come down hard and then they didn’t, leaving their opponents off balance. The fact that there was so much variance in the ways officials reacted shows that no common approach was planned in the Kremlin. And Konstantin Kalachev of the Political Expertise Group said that the softer approach reflected an appreciation within the Kremlin that harsh measures would only lead to further radicalization and the growth of the opposition. Moreover, the calm response of the center reflected its “strength and confidence.” Dmitry Travin puts the absence of a crackdown into a broader context. He says that if the authorities were really afraid of a challenge, they would have acted exactly the opposite to the way that they did, taking a hard line in Moscow and a softer one elsewhere. But the Kremlin showed its confidence that everything is under control. Clearly, Putin doesn’t see Navalny as a competitor or a threat, Travin continues. One cannot understand what happened, he suggests, unless one recognizes that the Kremlin is not a single thing but a collection of competing groups who make use of whatever they can to advance their interests. Navalny can be used by some because he threatens others or at least can be made to look that way, the economist says. The Kremlin population is united in only one way: “the problem of personal enrichment is primary, and the problem of support for the regime is secondary.” Given that Navalny has only minimal impact on that goal, he can be allowed to function especially since he has proven incapable of mobilizing the population for something rather than just against corruption. If it were otherwise, he would not have been sentenced to 20 days but perhaps to 20 years. But in the absence of specific goals, his protest will peter out just as others have over the last two decades. And one can conclude, Travin says, that Navalny’s position has been weakened by what occurred last Saturday. “This doesn’t mean,” Travin says, “that meetings are senseless,” but they are meaningful more in an ethical than a political sense, as an affirmation of one’s right to take a position and to act. At some point that may grow into a political movement but not immediately, the commentator suggests. Vitali Shkliarov campaigned for Obama and Sanders. His ideas helped boost liberals in Moscow elections last month. Russian president Vladimir Putin warned about the risks of cryptocurrencies on Tuesday and indicated regulators in Moscow were ready to crack down on the boom. Software produced by Microsoft Corp has been acquired by state organizations and firms in Russia and Crimea despite sanctions barring U.S-based companies from doing business with them, official documents show. The carrier’s long delayed deep refit and modernization program has had its budget slashed in half putting in question the carrier’s future relevance. The Ratnik-3 is a future infantry combat suit with a built-in exoskeleton, state-of-the-art reconnaissance and weaponry and, now, a nuclear-resistant watch. The joint strategic Russian-Belarusian military exercise Zapad 2017 (“West” 2017), which took place on September 14–20, is worth studying in detail because of what it reveals about Moscow’s likely military operations in the westward direction in the event of a regional crisis. At the same time, the Zapad drills had important political and informational overtones aimed directly at the West. Generally speaking, the military tasks accomplished within the scope of Zapad 2017 were typical for maneuvers of such scale. But at the same time, the exercise had some distinctive features. In particular, the Russian military top brass was using the joint drills to check the readiness of the Belarusian army to act under the command of the General Staff of the Russian Armed Forces. The exercise also included an assessment of the Belarusian Armed Forces’ compliance with Russian military standards in order to ensure their full compatibility in joint operations (Regnum, September 19). In this context, it should be noted that the same compatibility and chain-of-command checks were carried out during the joint Russian-Belarusian operational exercise Union Shield 2015. In assessing those maneuvers, the commander of the Western Military District, Anatoly Sidorov, noted at the time that one of its central features included the subordination of the military forces of another state and their command during joint training tasks (RIA Novosti, October 21, 2015). In other words, within the framework of Zapad 2017—and Union Shield 2015 before it— the Russian side specifically sought to evaluate how smoothly the General Staff of the Armed Forces of the Russian Federation could bypass various pre-existing layers of command and control, including the General Staff of the Armed Forces of Belarus, in order to take direct command of Belarusian units. Russia’s ongoing focus on this issue is telling. It highlights the thinking in Moscow that, in the event of an offensive operation in the western strategic direction, the Russian General Staff would need to be certain that all its orders will be carried without question by Belarusian soldiers. Russian commanders also want to be sure they will not encounter any obstacles or push back from individual patriotically-minded (to their homeland) Belarusian military leaders. Russian President Vladimir Putin expressed on Tuesday his gratitude toward his Moldovan counterpart Igor Dodon for the latter’s efforts to boost relations between the two countries. Ukrainian President Petro Poroshenko says he strongly disagrees with Czech President Milos Zeman's statement that the annexation of Ukraine's Crimea by Russia is a 'fait accompli.' News 11 October from UNIAN. 11.10.17 10:07 – Poroshenko enacted NSDC ruling on General Headquarters President of Ukraine Petro Poroshenko signed a decree to enact the ruling by the National Security and Defense Council (NSDC) dated Sept. 13, 2017 On General Headquarters. View news. Russia's hybrid military forces attacked Ukrainian army positions in Donbas 15 times in the past 24 hours, as a result of which four Ukrainian soldiers were reported wounded in action (WIA), according to the press service of the Anti-Terrorist Operation (ATO) Headquarters. News 11 October from UNIAN. Ukrainian civil volunteer and activist Yuriy Mysyagin claims that an enemy reconnaissance group has been destroyed at the Svitlodarska Duha bulge in Donbas. News 11 October from UNIAN. Secretary of the National Security and Defense Council of Ukraine (NSDC) Oleksandr Turchynov has said that the latest samples of weapons and military equipment will soon be used on the front line. Kyiv hosts the XIV International specialized exhibition ‘Arms and Security – 2017’ in Kyiv. National Ivan Cherniakhovskyi Defence University demonstrates its scientific research laboratory of arms and special protective materials that studies the problems of increase of effectiveness of individual and collective protective gear. In 2014 – 2017, the laboratory specialists have carried out more than 400 ballistic tests of armour materials and protective gear. The tests showed that a half of items failed to meet the requirements for protection classes. It permitted to avoid supply of bad items for the Armed Forces and other security institutions of Ukraine. This year, the university laboratory can become the single laboratory in Ukraine issuing the quality certificates under NATO standards to defence industry manufacturers. Ukrainian Defense Minister Stepan Poltorak has announced the ministry plans to increase financial resources for modernization and purchase of brand new equipment, in&nbsp;particular&nbsp;BTR-4E&nbsp;armored&nbsp;personnel carriers (APCs). News 11 October from UNIAN. General Poltorak said about it at the XIV International specialized exhibition ‘Arms and Security – 2017’. “It is time-consuming to put equipment into service and make it more effective. If we compare first Ukrainian anti-tank systems Stuhna and Korsar and their current versions, we’ll see the difference. That’s why the acquisition volumes are being increased,” the Minister said, “This year we have amended the state defence order and plan to increase the order of antitank guided missiles Stuhna and Korsar”. He also mentioned, ‘If we compare current tasks and capabilities, now we have the equipment permitting us to accomplish combat tasks’. “But we understand that equipment should undergo modifications and modernizations. Our priorities for the next year are air defence equipment, anti-tank equipment, electronic warfare equipment, unmanned aerial vehicles, other spheres which will boost combat capabilities of our Armed Forces,” the Minister informed. State Enterprise Plant 410 Civil Aviation and the leading American Rockwell Collins Company, specializing in manufacture and development of digital and electronic systems for aviation, as well as other avionics, signed a memorandum of cooperation. The National Police of Ukraine will purchase professional communication systems from Turkey's leading defense company Aselsan. At the request of the European Court of Human Rights (ECHR), Ukraine is sending to Krasnodar a group of doctors to check on the health condition of an illegally detained 19-year-old Pavol Hryb, despite Russia not having issued a relevant permission, that&rsquo;s according to a comment to UNIAN by director of the consular service department of the Ministry of Foreign Affairs of Ukraine Serhiy Pohoreltsev. News 10 October from UNIAN. Four Ukrainian nationals, including member of the Verkhovna Rada Volodymyr Parasiuk, have been arrested in absentia in Russia for attacking Russian diplomatic missions in 2014-2016 and put on the international wanted list, according to Russian news agency TASS. News 11 October from UNIAN. Investors from Singapore and the United States plan to invest about US$300 million in the construction of two vegetable oil extraction plants, a grain terminal, and&nbsp;transshipment&nbsp;facilities in Odesa region's Lyman district, according to Odesa Regional State Administration. News 11 October from UNIAN. 11.10.17 15:30 – SAP detained Lieutenant General Ihor Pavlovskyi The name of the deputy defense minister of Ukraine who was detained by Special Anti-Corruption Prosecutor’s Office (SAP) has been made public. View news. 11.10.17 13:29 – Trial of Yanukovych: hearing lasted for two minutes as attorney did not show up On Wednesday, Oct. 11, the Obolonskyi district court of Kyiv held 14th hearing in the case of high treason against fugitive former president of Ukraine Viktor Yanukovych. View news. The Ukroboronprom State Concern has made a successful debut at the AUSA 2017 Annual Meeting & Exposition (the Association of the United States Army). The Association of the United States Army’s Annual Meeting is the largest landpower exposition and professional development forum in North America. Taking place over three days, the Annual Meeting is designed to deliver the Army’s message by highlighting the capabilities of Army organizations and presenting a wide range of industry products and services. AUSA accomplishes this task throughout the entire event by providing informative and relevant presentations on the state of the Army, panel discussions and seminars on pertinent military and national security subjects, and a variety of valuable networking events available to all that attend. The military experts and visitors of the Ukrainian stand at the AUSA 2017 saw promising Ukrainian armored vehicles, including BTR-4 8×8 wheeled armoured personnel carrier (APC) and updated Phantom-2 unmanned tactical multipurpose vehicle, promising precise aircraft weapon, new radar systems, new small weapons and artillery armament. A total of 20 Ukroboronprom’s members exhibit their products at the AUSA 2017, including Malyshev Plant, Morozov Machine Building Design Bureau, Kyiv and Zhytomyr Armor Plants, Artem Machine-Building Firm, Radar Kyiv Plant, Mykolaiv Aircraft Repair Plant, Konotop-based Aviakon aircraft repair plant, Artillery Armament Design Bureau, Iskra Scientific and Production Complex, Mayak Plant, Ukrspecexport state-owned enterprise and its subsidiaries: Spectechnoexport, Promoboronexport, Progress, Ukroboronservice and Ukrinmash. The Ukrainian military industry is increasingly getting integrated into the Western model, and all the equipment has been tested in combat conditions. 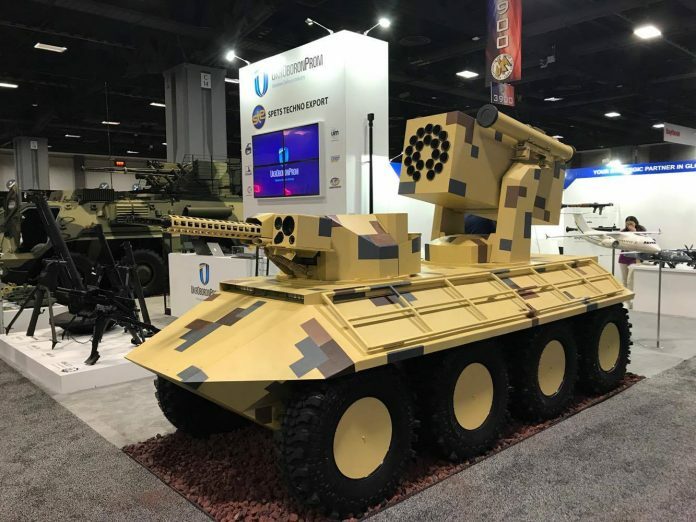 Several dozen types of innovative developments of the Ukrainian defense sector, including armored vehicles, small arms, aviation, missile systems and other new products, were showcased for the first time in the United States at the prestigious international exhibition AUSA 2017 (the Association of the United States Army). A three-day exhibition, attended by about 600 companies from all over the world, began in central Washington on Monday, October 9. 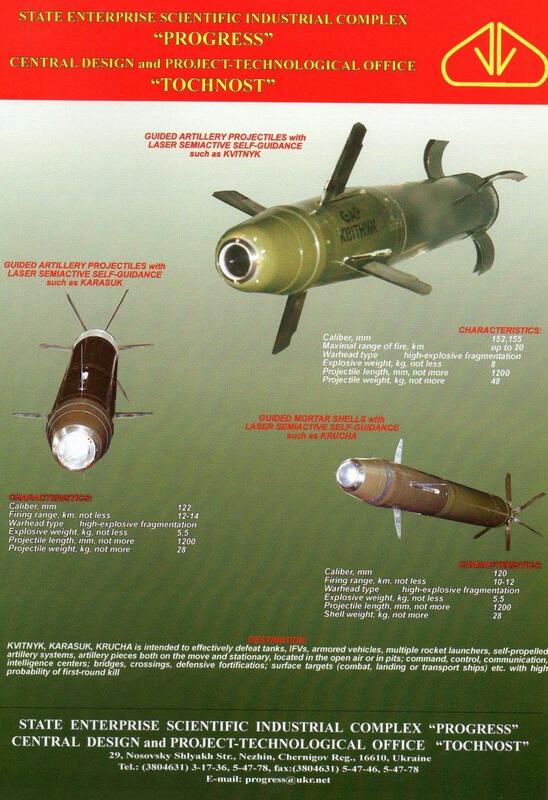 Domestic machinery and weapons are officially represented by the Ukroboronprom State Concern. The SFTE “SpetsTechnoExport”, part of UkrOboronProm, has unveiled its new Phantom-2 unmanned tactical multipurpose vehicle at the AUSA 2017 Annual Meeting & Exposition (the Association of the United States Army in Washington. The improved version of the new Phantom-2 (also called Fantom-2) unmanned tactical multipurpose vehicle provides more firepower and a stand-off capability to detect and confirm the presence of, identify the disposition of, and counter hazards by carrying various platform payloads in support of current and future missions. The “Phantom-2 based on 8×8 wheeled chassis and is designed to support tactical level operations on the battlefield. This modification allows for bigger payloads and, correspondingly, for more powerful weapons on top of the carrier. One of the key features of the Phantom is its anti-tank missile system, called Barrier, and its new rocket launcher turret for RS-80 rockets. Also, the “Phantom-2 is equipped with a remote weapon station (RWS) that can carry a weapon fit as per an operator’s requirements – one such configuration features an armed with a 30mm cannon. The UGV is intended to perform a variety of tasks in complex urban environments. Its mission capabilities include combat, reconnaissance, ammunition transportation to forward operating bases, and evacuation of wounded soldiers from the battlefield. Ukrainian state defence manufacturer UkrOboronProm has taken the opportunity at the Arms and Security exhibition being held from 10 to 13 October to unveil a prototype wheeled armoured fighting vehicle that is presently known as the BTR-4MV1. The new BTR-4MV1 is the latest generation of 8×8 APC armoured personnel carrier designed, developed and produced by the Kharkiv Morozov Machine Building Design Bureau, part of UkrOboronProm. The BTR-4MV1 is designed in accordance with NATO standards. The vehicle is based on the BTR-4 but with many new improvements. It differs from the previous versions mostly in a modified configuration of the vehicle’s hull, which makes it possible to install additional types of protection (including the ceramic plates and explosive reactive armour) to reach the fourth and fifth protection levels in accordance with the NATO standards. Apart from that, the hull rear is fitted with a ramp that not only enables troopers to enter and leave the vehicle much quicker, but also enables the armoured personnel carrier to transport various large-size cargoes, including additional ammunition, spare parts, etc. President Donald Trump is expected this week to “decertify” the Joint Comprehensive Plan of Action (JCPOA), better known simply as the Iran deal, declaring that the agreement reached in 2015 by the U.S. and five other international powers is not in America’s national interest. As the Trump administration prepares to take a tougher line on Iran, senior US officials previewed a new offensive against Iranian-backed Hezbollah, claiming the group aspires to conduct attacks against the US homeland. 11.10.17 10:50 – About 20 Russian official military killed in Syria in two weeks, – terrorist Girkin Over the past two weeks, about 20 Russian official military were killed in Syria, and three times more non-official fighters from private military companies. View news. The lira erased gains against the dollar after the White House backed its ambassador’s decision to suspend visas from the country and a Turkish court convicted in absentia a journalist from The Wall Street Journal. The latest figures from Air Force Central Command show that more bombs are being dropped than have been in nearly seven years. North Korea will, without a doubt, define Trump’s presidency. Among the data stolen in a hack last year was a plan to remove the North Korean leader Kim Jong-un, referred to as the “decapitation” plan. Hyon Song-wol, who was once falsely rumored to have been executed for starring in a pornographic video, is the leader of the all-female music group Moranbong Band. President of the Czech Republic Milos Zeman has shared his personal view with the Parliamentary Assembly of the Council of Europe that Ukraine's loss of Crimea is fait accompli and Russia can pay Ukraine compensation for the annexation of the peninsula to avoid European war, according to footage posted on the PACE's website. News 10 October from UNIAN. On 23 September 2017, Siemens‘ CEO Joe Kaeser gave an interview with the German outlet Spiegel in which he said that, despite Siemens’ 160-year “relationship of trust” with Russia being “burdened” with Siemens gas turbines ending up in two power plants under construction in occupied Crimea in July 2017, a “whole country with its loyal and reliable” customers can’t be blamed for violating EU sanctions and helping Russia secure its occupation of the peninsula, and the German techno giant shouldn’t “overreact.” He said this answering a question whether he felt he had been deceived by Russian President Vladimir Putin, who, according to the German newspaper WirtschaftsWoche, had promised the German Foreign Minister that the turbines, produced on factory jointly owned by Siemens and the Russian company Power Machines that the turbines would not end up in Crimea, which before being occupied by Russia in 2014 was energy reliant upon mainland Ukraine. After the turbines finally ended up in Crimea, Siemens’ claimed it was innocent, had been duped by its Russian partner OAO Technopromexport, and was confident until the very end that the turbines are being produced for a power station in the Taman peninsula. In this interview, Joe Kaeser repeated that claim. We decided to fact-check his statements with the help of our open-source investigation How Siemens chose to ignore the obvious. An investigation into the Crimean sanctions break. Far more murkiness than clarify after Catalonia’s leader spoke of new republic but also raised prospect of delay for dialogue with Spain. While he reasserted the region’s right to independence, his decision will do much to delay a looming constitutional crisis as well as to calm European nerves. The international media will embrace all things Bolshevik this autumn as the world marks the centenary of the Russian Revolution. Audiences can expect everything from gushing feature articles about early Soviet cinematography to edgy op-eds on the place of propaganda posters in twentieth-century art. Amid this deluge of Communist kitsch, we are unlikely to see a serious analysis of Ukraine’s 1917–21 statehood bid and its considerable relevance to the geopolitical tensions of today. Raytheon Missile Systems has presented its offering for the U.S. Army’s Long-Range Precision Fires program, a precision-guided missile aptly named DeepStrike. Raytheon Missile Systems has presented its offering for the U.S. Army’s Long-Range Precision Fires (LRPF) program, a precision-guided missile aptly named DeepStrike. The weapon is competing against an alternative by Lockheed Martin to succeed Lockheed’s MGM-140 Army Tactical Missile System (Atacms), developed in the 1980s. Raytheon and Lockheed were awarded contracts in May to develop competing prototypes under a 34-month LRPF technology maturation and risk-reduction phase. Raytheon presented a mockup of the DeepStrike missile at the Association of the U.S. Army exposition in Washington this week, standing alongside the company’s proposed land-based Standard Missile-3 and SkyCeptor interceptors. Ryan Braden of Raytheon’s advanced land warfare systems group said during an Oct. 9 interview that DeepStrike has passed through an initial design review and the prototype is now being developed for first flight in 2019. “The objective is to get this to the Army as quickly as possible,” Braden says. “The whole purpose of the TMRR phase is to have an engineering and manufacturing development-ready missile at the end, so we can roll into development and start low-rate production.” The goal of the LRPF program is to field a smaller, longer range Atacms successor. The TMRR phase of the program will culminate in a live-fire test of one prototype missile, probably at White Sands Missile Range in New Mexico. The Army is planning to award up to four efforts to generate concepts for a missile defense radar capable of seeing 360 degrees within weeks, according to Barry Pike, the Army’s program executive officer for missiles and space. The Russian cybersecurity firm is in the spotlight because of suspicions its products facilitate espionage. President Trump said he wanted what amounted to a nearly tenfold increase in the U.S. nuclear arsenal in a meeting with military leaders this summer. We’re all connected online, but no one’s in charge to prevent abuses. Former Trump foreign policy adviser Carter Page told CNN Monday he is going to plead the Fifth Amendment to keep from turning over a “vast array” of documents the Senate Intelligence committee requested, which he said is “beyond the charter” of the inquiry. Ten sailors died as a result of the accident.